By far the most popular hut on the Snow Farm, the Meadow hut is nestled against the start of the Roaring Meg River and can sleep up to 20 people. 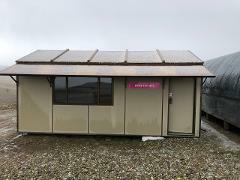 Not even a decade old, the hut has solar lighting, is well insulated and is ideal for large and small groups. It is also only a relatively short distance from the trailhead and you can ski, snowshoe or walk (summer, spring or autumn) from the main base area – approximately 4.5 km. The hut is accessible in summer by walking or mountain biking, there is no motorised access without prior permission. During summer there is no gear transfer to and from the huts and you must carry in and carry out everything you take with you, especially your rubbish. The huts are fully equipped with cutlery, plates, pots, pans, mugs and full gas hobs to cook on. We also supply dishwashing detergent, tea towels and there is a toilet on site as well. Solar lighting will keep you illuminated at night and no candles are permitted at the huts due to fire risk. While there is no cell phone coverage at the Meadow Hut, a short walk up and out of the valley to the east will get cellphone (Vodafone) cellphone coverage. Summer vehicle access is only available if you book the Meadow Hut Exclusively or in rare cases can be approved through a request to Snow Farm management. By far the most popular hut on the Snow Farm, the Meadow hut is nestled against the start of the Roaring Meg River and can sleep up to 20 people. Not even a decade old, the hut has solar lighting, is well insulated and is ideal for large and small groups. It is also only a relatively short distance from the trailhead, and you can ski, snowshoe or walk (summer, spring or autumn) from the main base area – approximately 4.5 km. The hut is accessible in summer by walking or mountain biking, there is no motorised access without prior permission. During summer there is no gear transfer to and from the huts, and you must carry in and carry out everything you take with you, especially your rubbish. The huts are fully equipped with cutlery, plates, pots, pans, mugs and full gas hobs to cook on. We also supply dishwashing detergent, tea towels and there is a toilet on site as well. Solar lighting will keep you illuminated at night, and no candles are permitted at the huts due to fire risk. Exclusive hut bookings may take one support vehicle in with them; however, if weather conditions are not favourable management reserves the right to decline vehicle access, all guests should be able to transport themselves to the hut if the conditions are not suitable for vehicle support. This is to preserve the trails and the environment at the Snow Farm. 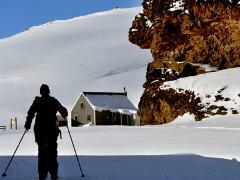 Set atop the northern end of the Snow Farm, the Bob Lee hut is a fantastic place to spend a night or more. Situated on top of a ridge with views down across the Pisa range and out to the Southern Alps, the view will literally take your breath away. The Main hut is able to sleep 7 people and the Annex hut (separate hut with no heating) is able to sleep an extra 7 people. Please note each hut has a separate booking page. 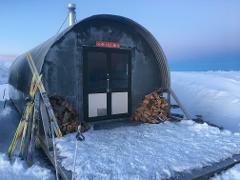 The hut is about 6 km from the main base area. The Bob Lee is accessible in summer by walking or mountain biking along the river run trail, there is no motorised access without prior permission. During summer there is no gear transfer to and from the huts and you must carry in and carry out everything you take with you, especially your rubbish. The Bob Lee hut is fully equipped with cutlery, plates, pots, pans, mugs and full gas hobs to cook on. We also supply dishwashing detergent, tea towels and there is a toilet on site as well. Solar lighting will keep you illuminated at night and no candles are permitted at the huts due to fire risk. There is (Vodafone) cell phone reception at Bob Lee Hut. The Daisy Lee hut has 6 beds in three bunks and its own wood fireplace. The hut features a sink and preparation area for food as well as two gas cookers. The Daisy Lee is accessible in summer by walking or mountain biking along the river run trail, there is no motorised access without prior permission. During summer there is no gear transfer to and from the huts and you must carry in and carry out everything you take with you, especially your rubbish. The Daisy Lee hut is fully equipped with cutlery, plates, pots, pans, mugs and full gas hobs to cook on. We also supply dishwashing detergent, tea towels and there is a toilet on site as well. Solar lighting will keep you illuminated at night and no candles are permitted at the huts due to fire risk. The Bob Lee Annex Hut, is the second hut at the Bob Lee Hut location and can sleep 7 people. Cooking facilities are located in the main Bob Lee hut and are to be shared. The Bob Lee Annex hut (separate hut with no heating or cooking facilities) it has 7 beds on top of the Bob Lees 7 beds, allowing up to 14 people to stay in this amazing location. Please check the bob lee hut before booking the Bob Lee Annex. The Bob Lee is able to be booked exclusively but cannot be done online. Please contact us using our contact form to make a request to exclusively book the Bob Lee Hut. 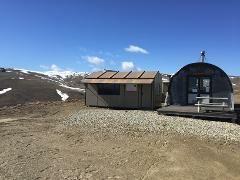 Set atop the northern end of the Snow Farm, the Bob Lee hut is a fantastic place to spend a night or more. Situated on top of a ridge with views down across the Pisa range and out to the Southern Alps, the view will take your breath away. The Main hut can sleep seven people, and the Annex hut (separate hut with no heating) can sleep an extra seven people. The hut is about 6 km from the main base area. The Bob Lee is accessible in summer by walking or mountain biking along the river run trail, there is no motorised access without prior permission. During summer there is no gear transfer to and from the huts, and you must carry in and carry out everything you take with you, especially your rubbish. The Bob Lee hut is fully equipped with cutlery, plates, pots, pans, mugs and full gas hobs to cook on. We also supply dishwashing detergent, tea towels and there is a toilet on site as well. Solar lighting will keep you illuminated at night, and no candles are permitted at the huts due to fire risk. *Bookings should not be conditional on vehicles access. Snow Farm is committed to preserving the natural environment and conditions of our trails if management feels damage may occur to the trails you will need to be prepared to access the hut without vehicle support.